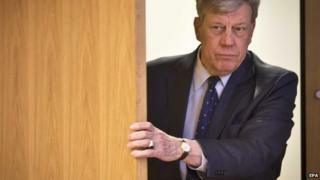 Dutch Justice Minister Ivo Opstelten and his state secretary, Fred Teeven, have resigned after misleading parliament over a 2001 compensation payment to a convicted drug trafficker. Mr Opstelten had said the trafficker was paid less than he actually was for money wrongly confiscated by the state. He also said details of the payment - authorised by Mr Teeven as prosecutor - had been lost, but this was not so. The resignations are a blow to the Liberal party as it faces an election. Mr Opstelten and Mr Teeven are both from the conservative wing of the party, which faces a challenge from Geert Wilders' far-right Freedom Party in provincial elections this month. The resignations are also expected to place a strain on the Liberal's coalition with the Labour party, which has been very critical of Mr Opstelten and Mr Teeven. The justice minister had claimed that a convicted drug trafficker, Cees Helman, was paid much less than the compensation of 4.7 million Dutch guilders - worth €2.1m (£1.5m; $2.3m) in current terms - that he in fact received. He also said that the details of the payment had been lost. On Monday, however, Mr Opstelten said a record of the transaction had been found. "This information could have been found earlier," he told reporters. "I take full responsibility for this and have just now offered my resignation to the king." The payment was made after the authorities were unable to prove that money they had confiscated from Helman had been obtained illegally. Mr Teeven, who was a prosecutor at the time, had authorised the settlement. The payment was not illegal. However, both ministers said the misinformation had made their positions untenable, Reuters news agency reports.